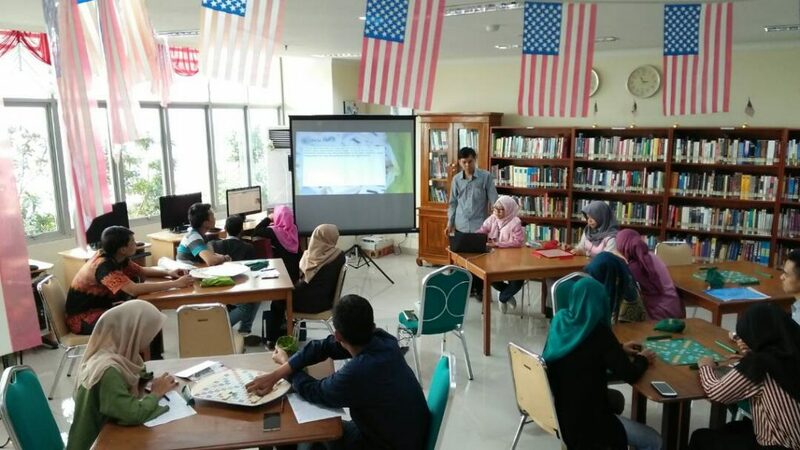 American Corner Room, UIN NEWS Online – Student Activity Unit (UKM) Foreign Languages Association (FLAT) UIN Jakarta together with American Corner held a “Scrabble Workshop”. This activity was one of FLAT work programs series in popularizing scrabble games, composing words in a board, in an academic environment. This workshop was held on Friday (26/05) in American Corner room. The activities were attended by Head of UIN Jakarta Library Center Amrullah Hasbana, FLAT Skill Development Department Staff who represent UIN Jakarta in the national scrabble in BNEC Open 2017 Riki Hanafy, General Chairman of FLAT Alif Waisal, the committee board and scrabble workshop participants. Amrullah, in his speech, explained that American Corner provide facilities that can be used commonly by academic community. “American Corner provides varieties of facilities and services to accommodate UIN Jakartaâ€™s students, there is an educational movie, and discussion room to support English activities for UIN Jakarta academic community,” he said. He added, scrabble was a game that can improve intelligence and skill in English. There were at least two main requirements in playing this game, which are the gamer should know well amount of vocabulary and have good spelling ability. “FLAT can be a model plus a pioneer which promote another games which exist in UIN Jakarta, with the expectation to other competition events. Amrullah hoped that this scrabble activities initiate and can be extended to articles writing as an outcome, then to journals, “Amrullah asserted. In the same place, Riki explained about the meaning of scrabble. “Scrabble is a game of words played by 2, 3, or 4 participants, in a certain time in rotation. Each player tries to form interconnected words on the board using tiles which each tiles has a certain number on it, “explains Riki. He added that scrabble games have lot of benefits. Playing scrabble can improve English vocabulary, social interactivity, learn for quick counting, and improve linguistic power. “Playing scrabble can also improve thinking strategies and imagination in finding new words,” said Riki. Chairman of FLAT, explained that after holding this workshop, there will be held Scrabble On The Road show (SOTR). SOTR take place with the aims to promote scrabble by playing it together, this activity is held four times during Ramadan fasting month and held at several places, FITK Lobby on May 31, FU Lobby on June 2, FST Lobby on June 7, and FISIP Lobby on June 12.